Hi there friends. I'm home for the afternoon to catch up on things around here. My mother-in-law is doing well, thank you to all who checked on us! ANYWAY.... people, as per usual I'm looking for things I can't find. 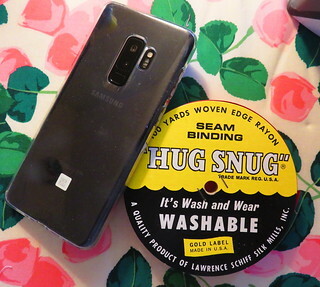 I have a half used spool of vintage Hug Snug seam binding that I needed for a quick project. CAN NOT FIND IT. There are few things that have a regular place here, and this tape is one of them. AND IT'S NOT THERE. It's not even there the second or third time I looked! Which sad to say often happens. I have torn the place apart looking for it. At one point I even lost my phone along the way and spent another 10 minutes backtracking my trail looking for it. The saddest part of this story is, I have a fresh new spool and I can totally cut off the pieces I need and move along with my life, and eventually I did it, but I still feel like I need to search for the other spool. Sigh. Well it's not like I haven't moved on for the most part. I mean I'm still me. I almost have everything is checked off my list of things to do here. Hope you're doing well. I love keeping up with you guys that are on Instagram. I'm not doing much but hey did you see I did some hand sewing? Kind of crazy for me but I loved it! Elise sent me some of her Dilly Flower papers to try and I thought it was so fun. I have been inspired by her photos.. check out her IG feed here. P. S. Cross your fingers it's not with the tailor's ham! I have about ten spoils of that stuff if you need any fun colors. Yours ran off with the tailors ham. LOL!